The Menagerie is celebrating a very special occasion at the end of this month. Saturday 26 marks the show’s third birthday at The Fringe Bar. Since 2013 the Menagerie has hosted everything from acrobats and burlesque acts, through to glass-eaters and xylophonists. Rouge has become a regular figure at live entertainment across the capital, always on the search for the new, unusual and bizarre acts. The Menagerie will be celebrating with a ‘Best Of’ line up curated by Menagerie main-stay Eli Joesph. Eli is bringing back crowd favourites, and some exceptionally unusual acts. Alongside internationally performing clowns and aerialists, audiences can also expect prize winning comedians and burlesque dancers. Plus a performance from Rachel Rouge herself. The Menagerie’s third birthday is on at the Fringe Bar, Saturday 26th November. Tickets available from eventfinder.co.nz or on the night. Producer of The Menagerie Rachel Rouge, donated her left kidney to the waitlist via the New Zealand kidney exchange programme. Here’s a picture of Rachel’s actual kidney before it went to its new home. Before Rachel donated she shared a bit of her testing experiences at The Menagerie’s May show. You can watch a video of it here (the focus is drunk, but the sound is ok). 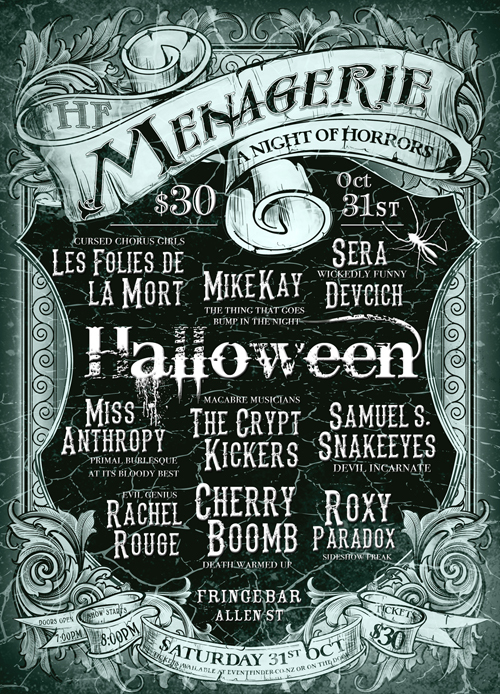 For this month only, The Menagerie is being hosted in a special pop-up venue that also happens to be the home of Rachel Rouge – The Menagerie’s director. For the 30th of April, producer Harlow Lestrange, hopes to capture a quirky, fun and relaxed vibe, like no other house party you’ve ever been to. Rouge will also MC the show, which features a fabulous line up put together by Harlow Lestrange, including: Australian hula hoop burlesque artist Hannie Helsden, comedian Penny Ashton, local musician Benjamin Embers, drag king Hugo Grrrl, monsters Tangle and Dangle, cabaret artists The Dulcet Duo, general carnie mischief with Victor Victorious and the juggling brothers Zane and Degge. This month The Menagerie – Wellington’s monthly variety show – has outdone itself with a selection of internationally recognised, award winning and high caliber acts. Featuring two of New Zealand’s top burlesque performers: the stunning Duchess deBerry from Auckland, and the incredible Ruby Ruin from Christchurch. Also from Christchurch is our MC, Guinness Book of Records breaking comedy entrepreneur Shay Horay. We also have talented writer, director and comedian Cohen Holloway who has starred in What We Do in the Shadows, Good for Nothing, Until Proven Innocent, road trip short Coconut, Find Me a Maori Bride and the soon to be released Hunt for the Wilderpeople. Also in this fantastic line up is chanteuse Ruthie le Bleu, circus artist Imogen Stone, musician Joel Lester, singer Nancy Saltrocks, and contemporary dancer Francesca Willow who dances to poetry. Doors open at 7pm, show starts at 8pm sharp. Tickets are available online from Eventfinder or for cash on the door. It’s $30. The Menagerie, Wellington’s long running monthly variety show is making some progressive changes for 2016. Director Rachel Rouge has brought in a young local circus performer Harlow Lestrange to produce 5 shows this year. Lestrange will be producing 5 of this year’s eleven shows starting with Saturday the 27th of February. Lestrange is a hula hoopist and fire performer currently studying a diploma in Circus Arts and Dance at Whitireia. She has put together a brilliant line up for the show on Saturday February 27th. Lestrange’s first Menagerie includes: Australian burlesque artist Glitta Supernova, poet Olivia Hall, celtic duo Faí, MC Miss Lizzie, charismatic Ladderman fresh from the World Buskers Festival, mime KBG Purple, comedians Sarah Harpur & Snap, and accordion music from Sunshine Cannery. The Menagerie stage is bound to benefit from Lestrange’s fresh perspective, youthful vitality, new insights. As the days in Wellington get progressively longer, monthly variety show The Menagerie embraces the dark with their special Halloween show on Saturday 31 October 2015 at 8 pm at The Fringe Bar. While outside, bright sunny days and blooming daffodils bring the promise of summer, inside The Fringe Bar on the last Saturday of October the mood will be entirely different. Jars of wet specimens will decorate the bar. Skulls, weapons, cobwebs and creatures will hang from every corner. A caged vulture will ominously watch the curious display of talented performers. For the first time, The Menagerie will hold a best dressed competition, with prizes awarded to the best costume on the night. Bring out your inner vampire, zombie, witch, ghoul or devil and come along to a show that is sure to evoke the Halloween spirit in even the brightest of souls.